A portrait of General Frederick Funston, who grew up in Iola, Kansas, and became one of America's most famous military figures. Because of his height and weight, Funston failed an admissions test to the United States Military Academy in 1884. He enrolled and attended the University of Kansas from 1885 to 1888 but did not graduate. While there he joined the Phi Delta Theta fraternity and became friends with future Pulitzer Prize winner William Allen White. After leaving the university, he worked as a trainman for the Santa Fe Railway and in 1890, took a reporter's job in Kansas City. After one year reporting the news, Funston moved into more scientific exploration, focusing primarily on botany. In the early 1890s, he participated in scientific expeditions in the Dakota Badlands, Death Valley, and in Alaska along the Klondike and Yukon Rivers. In 1896 he joined forces of Cubans who were fighting for independence from Spain. He was immediately promoted to captain of an artillery unit. 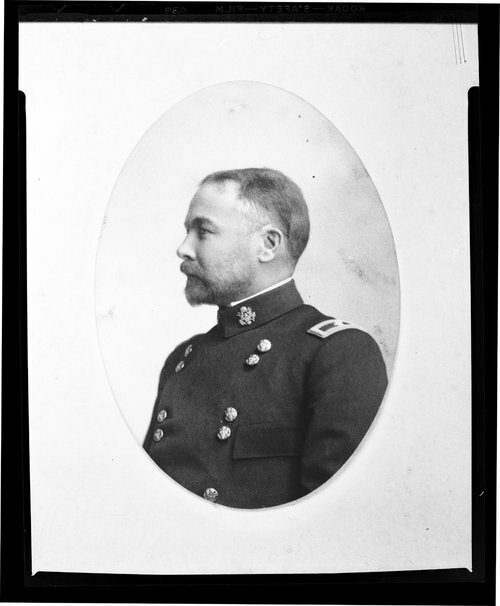 Funston served eighteen months under Generals Maximo Gomez, Calixto Garcia, and others. During this time he was wounded three times, lost seventeen horses, and was captured once. Shortly after returning home, Kansas Governor Leedy appointed Funston colonel of the 20th Kansas Infantry, which was soon sent to the Philippine Islands. On February 4, 1899, the insurrection broke out. Because of his leadership Funston was promoted to brigadier general of volunteers and in 1901 was given that rank in the regular army where he spent the rest of his life. In 1906 he did much to keep law and order in San Francisco and to provide relief to sufferers of the great earthquake. In 1914 he was in command of American troops on the Texas border during the difficulties with Pancho Villa. Future general, John J. Pershing, was one of his subordinates. On November 17, 1914 Funston was made a major general. A heart attack took the life of the 51-year-old general on February 19, 1917. His college friend, William Allen White, called him "one of the most colorful figures in the American army from the day of Washington on down." A portrait of General Frederick Funston, who grew up in Iola, Kansas, and became one of America's most famous military figures. Because of his height and weight, Funston failed an admissions test to the United States Military Academy in 1884. He enrolled and attended the University of Kansas from 1885 to 1888 but did not graduate. While there he joined the Phi Delta Theta fraternity and became friends with future Pulitzer Prize winner William Allen White. After leaving the university, he worked as a trainman for the Santa Fe Railway and in 1890, took a reporter's job in Kansas City. After one year reporting the news, Funston moved into more scientific exploration, focusing primarily on botany. In the early 1890s, he participated in scientific expeditions in the Dakota Badlands, Death Valley, and in Alaska along the Klondike and Yukon Rivers. In 1896 he joined forces of Cubans who were fighting for independence from Spain. He was immediately promoted to captain of an artillery unit. Funston served eighteen months under Generals Maximo Gomez, Calixto Garcia, and others. During this time he was wounded three times, lost seventeen horses, and was captured once. Shortly after returning home, Kansas Governor Leedy appointed Funston colonel of the 20th Kansas Infantry, which was soon sent to the Philippine Islands. On February 4, 1899, the insurrection broke out. Because of his leadership Funston was promoted to brigadier general of volunteers and in 1901 was given that rank in the regular army where he spent the rest of his life. In 1906 he did much to keep law and order in San Francisco and to provide relief to sufferers of the great earthquake. In 1914 he was in command of American troops on the Texas border during the difficulties with Pancho Villa. Future general, John J. Pershing, was one of his subordinates. On November 17, 1914 Funston was made a major general. A heart attack took the life of the 51-year-old general on February 19, 1917. His college friend, William Allen White, called him "one of the most colorful figures in the American army from the day of Washington on down."